Bouncing back strongly from an uncharacteristic 8-3 league loss to Chaparral on April 27, Boulder City High School’s softball program routed Del Sol 21-0 on Monday to get back on track. Laura Hubel/Boulder City Review Pitcher Jordan Moorhead went the distance in Boulder City High School's five-inning softball game against Legacy High School on Friday, where the Lady Eagles shut them out and scored 10 for the win. After pitching a solid strike, Moorhead fielded a hard-hit ball back to the mound and fired it to first baseman Lily Osman for the out. 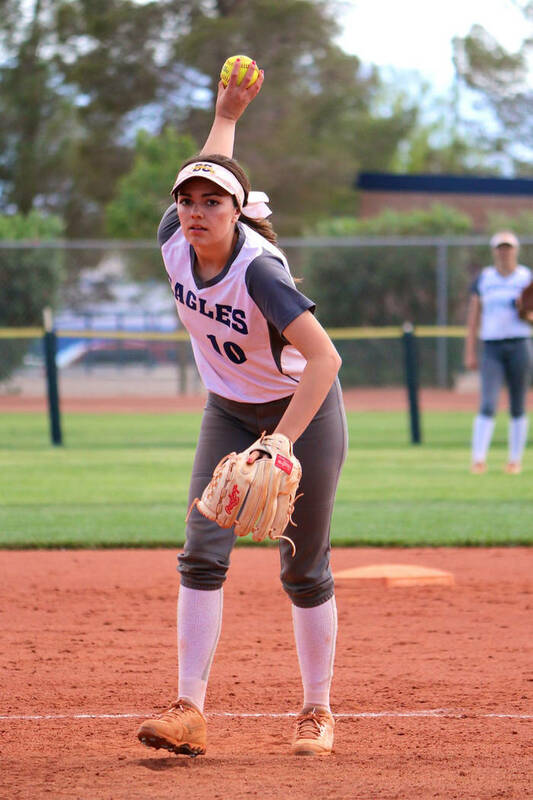 Making sure they handled their business Monday against the Dragons, the Lady Eagles wasted little time announcing that they’re still the top team in the 3A classification, exploding for 14 runs in the first inning of Del Sol starter Jazmine Rivera. Having her best game of the season offensively, junior Bailey Bennett-Jordan finished 3-for-3 at the plate with five runs batted in, including a two-run double in the first inning. Bennett-Jordan also threw a no-hitter in three scoreless inning, striking out seven batters. Continuing to handle the moment herself at the plate, sophomore slugger Marleena Mills finished the day 3-for-4 with a pair of RBIs, hitting a double in the first inning and a triple in the second inning. The Lady Eagles also defeated 4A opponent Legacy on Friday, behind a three-run home run from Lily Osman. Jordan Moorhead earned the victory against the Longhorns, throwing five innings where she allowed only four hits with a strikeout. Entering the postseason as the No. 1 seed in the Sunrise League, the Lady Eagles will host Western on Tuesday in the first round. Tuesday, vs. Western, 3:30 p.m.